Karfka the squirrel watches Meldwyn carefully as he places his offering on the illuminated stone. The squirrel resists his initial impulse to drop everything and bolt down his tree to score the peanuts and the beautiful shiny sticks of gum. He strokes the smooth surface of the iPod like it’s a powerful talisman or maybe a bottle containing a hot young genie. He murmurs to the device conspiratorially. To the casual observer, the words “my precious” might come to mind. Meldwyn watches for Karfka’s reaction from his spot near the stone. From his vantage point, he can see about half of the squirrel’s body above the edge of his nest. Sensing Karfka’s hesitation, Meldwyn takes a few more steps away from the offering he’s placed on the stone. This seems to give the squirrel the comfort level necessary to leave his nest and venture down to take Meldwyn’s gift. 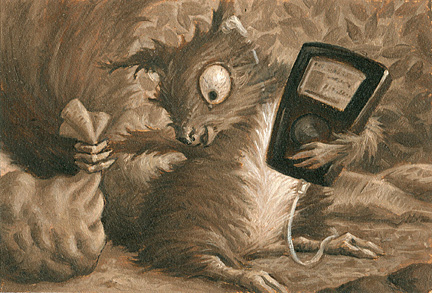 Karfka leaves his nest clutching the iPod, the earbuds still in his ears. Meldwyn takes this as a positive sign that perhaps Karfka has understood the nature of his offering and decided to do the right thing and return the ipod to him. The squirrel shimmies along a long branch, then leaps to another on an adjacent tree. He displays amazing agility and balance considering that he’s holding the iPod with one arm. Meldwyn’s kinda impressed despite himself. It takes Karfka no time at all to arrive at the stone altar. He furtively glances at Meldwyn, ready to escape if it turns out he’s been suckered. He peers cautiously into the bag containing the peanuts. Karfka then chitters softly to the illuminated screen of the ipod. Meldwyn thinks hopefully that perhaps the squirrel is saying a fond goodbye before leaving it in exchange for the peanuts. Meldwyn’s not quite so impressed as Karfka grabs the two sticks of gum, throws them into the bag containing the peanuts and tries to drag it off while still holding the iPod. Quickly realizing that he wouldn’t be able to climb safely with both hands full, Karfka drops the iPod into the bag as well. He then throws the bag over his shoulder. He looks like the anti-Santa as he jumps from the stone to the nearest branch. Oh, Poo! The light on the stone altar dims as Meldwyn kicks at a tuft of moss. He sighs, lifts his head, and turns away. Despite getting his hopes up, Meldwyn has prepared himself for the loss of his iPod. Though disappointed, he’ll stay on the high road and wish the squirrel well, thinking that it will make an interesting story at a party if he’s ever invited to one. He’s decided to be philosophical about the afternoon’s odd turn of events and he takes a moment to reconsider his role models. He realizes now that the nonviolent model of self-sacrifice as exemplified by Jesus and Gandhi and Martin Luther King didn’t really work out so well for them either. Yeah, they’re all revered and everything now, but in their time, their respective fates kinda sucked too. Of course, Meldwyn realizes that everything is relative and that in the big picture, the loss of an electronic gadget ain’t so bad compared to, say, being nailed to a cross. Meldwyn shrugs and gathers his backpack as Karfka bolts with his latest score back through the trees to his nest.